Practical Guide to Exercise Physiology CE Course gives health and fitness professionals the confidence to design physiologically sound exercise programs and educate clients about the science supporting the program design. Discuss how the muscles, heart, lungs, and nervous system respond to exercise and various forms of training. Explain how food is converted into fuel and how oxygen enables the breakdown of food into fuel. Understand how fatigue limits the capacity for exercise. Identify the three energy systems that muscle cells rely on to produce the ATP needed for muscle contraction. Design appropriate exercise training programs tailored to improve muscle mass and strength, speed weight loss, enhance speed and power, and maximize aerobic endurance. Educate clients in withstanding the rigors of training in heat, cold, and altitude. Understand the design of training programs for children, older adults, and pregnant women. Practical Guide to Exercise Physiology Print CE Course guides learners through the scientific concepts of exercise physiology with highly visual, easy-to-follow content. The course applies complex concepts of physiology to exercise program design, giving personal trainers, strength and conditioning specialists, and other health and fitness professionals an accessible resource to use with their clients. Written specifically for those in the fitness industry, the accompanying text covers various training goals and considerations when working with clients and athletes at all levels. 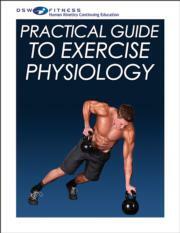 In conjunction with Practical Guide to Exercise Physiology by Bob Murray, PhD, FACSM, and W. Larry Kenney, PhD, this course takes an application-based approach to describing intricate physiological processes so that professionals can select and explain the appropriate exercises and physical activity regimens for clients. The accompanying text contains medical artwork that puts complex systems in a digestible visual format. Explanations of exercises and instructions on combining various exercises to achieve the desired results facilitate easy application to real-world practice. The study guide includes a course syllabus, learning objectives, learning activities, and referenced answer key. It emphasizes key concepts of the book to prepare individuals to pass the 50-question exam composed of multiple-choice and true-or-false questions at the completion of the course. Upon passing the exam, individuals may print out and submit a certificate for continuing education credits. Practical Guide to Exercise Physiology Print CE Course contains all the necessary information for new and current personal trainers and fitness professionals. Learners will gain confidence in designing exercise programs for various populations and the ability to explain to clients how each exercise and movement will help them achieve their goals.